What are the best stairlift brands? What do I need to get ready for install? How much does it cost for a stair lift? How does my stairlift battery charge? How long will my stairlift battery last? How often does my stairlift need servicing? What guarantee or warranties do I get with my stairlift? Can I remove the stair lift when I sell my home or no longer need it? 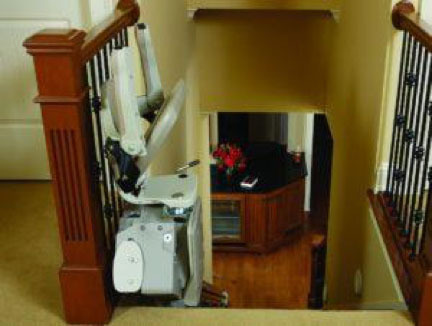 Are stair lifts, platform lifts, and home elevators difficult to install? Are there cost savings available for disabled veterans? Can a stair lift be removed? If getting up and down the stairs has become a daily struggle, and you have considered living downstairs, or moving into a bungalow or ground floor flat, then a stair lift, wheelchair lift, or platform may be what you’re looking for. Installing a stairlift elevator is often a more practical and cost-effective option, and it means less of a change to your lifestyle, allowing you to carry on living independently with the convenience of a mobility lift in your own home. Once you have decided that a stairlift is the right option for you, it is important to choose the mobility equipment that will best suit your stairlift needs. The answer is – It depends…… Modern stairlifts come in all shapes and a size, so determining the cost of a chair lift for stairs is dependent on the needs of the consumer AND the staircase involved for installation purposes. As a general rule, you should plan on budgeting somewhere between $2,000 and 5,000 for a professional straight-rail stair lift installation, and $10,000 to $13,000 for a curved-rail stair lift installations. We often get calls from customers who’s stairlift has been beeping and they’re not sure why. Most stairlift brands will beep to let you know that the unit is not on the charger or the batteries are going bad. The typical life of a stairlift battery is 3-5 years. Check the charger and make sure the red light is on the power supply. The wall switch is on. The power has not tripped/you haven’t had a power outage. The stairlift is parked correctly at the top or bottom of the stairs on its charge point. If all these conditions are met then it may be the battery. We have one easy flat rate to change out the batteries in most stairlift brands. If you have had a power cut, you can temporarily stop the beeping noise by pressing the battery isolation button. The location of this will vary depending on the type of lift you have – this should be shown in your User Guide but if you’re still stuck please feel free to give us a call. You will need to turn this back on once the power to the house has returned and you wish to use the lift. Most stairlifts take 2 x 12v batteries. It is possible to buy a straight stair lift an install the unit yourself. We often receive calls from people who were lured in by the low cost, only to find that the stair lift does not fit their stair case or the unit does not work correctly. Even worse, the seller offers no assistance or stops responding altogether, while the customer is stuck with a dysfunctional, dangerous piece of machinery. The State of MN requires a Permit and an Inspection of this type of mobility equipment. In order to get this you must have a Elevator Licensed with the state of MN. Many manufacturers may also void your warranty if you do not have it installed by an authorized dealer/ licensed professional. Check here for the best stairlift consumer reports with stairlift reviews review on the web. You may need to hire an electrician to ensure power is available within 10 feet. Yes, there are specific stairway lift models that are designed to fit staircases that have curves, turns, or intermediate landings. These types of chairlift models have rails that are custom designed to fit the exact design of your own staircase. At one of our showrooms you’ll be able to see Stannah, Bruno and Acorn chair lifts on the stairs. To have a stair lift installed in your home, for most straight stairways, you should budget between $2,500 – $5,500. Many Minnesota homeowners choose a model within the $3,000 – $4,500 stairlift price range. The stairlift recharges when the chair is in the parked position. 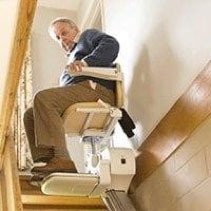 Depending on usage, the stairlift battery will last 3-5 years. The remote control batteries should be replaced annually. Your stairlift needs servicing every 6-12 months depending on the stairlift make and model. This will be detailed in your stairlift manual. First, don’t worry! Your stairlift is battery powered and will continue to work during power outages. Below are a few tips to help you use your lift until you get the power back. During a power outage, your battery-powered stairlift will continue to work and will typically have enough power to get up and down stairs between 10 and 20 times. This number will vary depending on the length of the ride, the condition of the batteries and the weight of the user. If the batteries die during use, turn the lift off and then back on using the switch on your armrest. This will allow you to travel a short distance downstairs. Repeat this process until you reach the bottom. If the power goes out the stairlift will start to beep, indicating that it is no longer charging. You can temporarily stop the beeping by turning off the Battery Isolation Switch on the stairlift – it’s the large white switch below the seat. If your stairlift is the type with two tubular rails that go around corners, you have a curved stairlift and the switch will be on the front of the stairlift. If it’s straight, it’ll be on the back side. ONLY TURN OFF THIS SWITCH IF YOU CAN REACH IT SAFELY! Remember to turn the switch back on when you want to use the stairlift. Yes, We also do safety tests once a year? Price covers 1 hour of labor in addition to the test. Yes! In fact we receive numerous calls of this nature from clients who are not satisfied with their original stairlift installer or are unable to get aftercare support from them and would prefer to have Stairlift repair services look after their stairlift repairs and maintenance. Contact us at 651-592-5959 for further details. Stairlifts are built for safety! And, at StarLift, we use top-quality equipment and technology. We install your equipment safely and carefully while complying with all rules and codes established by the ASME, OSHA, and the BBB where we have a proud grade of 10/10! You won’t have to worry about the safety of your home lift when you get it installed by our experienced technicians. Some people worry that a stairlift will make their home less attractive to buyers. If you’re worried about this, you can get the stairlift removed. When done correctly, removing the stair lift will not cause damage to your home. Your floors can be patched and returned to their original condition. Call Star Lift 651-592-5959 if you need your lift professionally removed. Wheelchair lifts and platform lifts are simple elevators designed for wheelchair users and scooter users. When installed inside or outside your home, they will lift you and your mobility equipment up or down, safely and easily. Home elevators are small elevators designed for residential use. They are designed to fit in your home while still being sturdy and strong enough to support you and your mobility equipment. They’re available by a variety of stairlift brands in different designs to suit the look of your home. No—our expert technicians can install your new equipment in about 4-6 hours, saving you time and hassle. We don’t cut corners when it comes to safety and security. Yes—in most cases, the Department of Veterans Affairs gives cash grants to veterans for home mobility devices. You can look at these 3 programs for details: the Home Improvements and Structural Alterations grant (HISA), the Specially Adapted Housing grant (SAH) and the Special Home Adaptation grant (SHA). Qualified vets can get both a HISA grant and an SAH or SHA grant. To get these grants, apply using VA form 26-4555 and send it to your VA regional office. For more information, call 1-800-827-1000. Does your company Rent Stairlifts? Are stair lifts taxes deductible? What is the weight limit for a stair lift? Does someone need to come out and measure my stairs? What is the stair lift attached to when installed? Will it ruin or damage the walls? Why I shouldn’t buy a lift on the internet or out of the newspaper? Can a stair lift be installed outside and if so, will it be protected? How noisy are stair lifts? Do I need to plug in and charge my stairlift? Can more than one person ride on the stairlift at a time? Why are there so many names for a stairlift , stair lift, chair lift? What are the differ types of Stairlifts? What are the Difference between a Stair Lift and a Wheelchair Lift? How do you get off the lift safely? What is the Longevity and Maintenance? Yes, we have many options. Visit our Financing page or get in contact with us today to learn about our financial options. 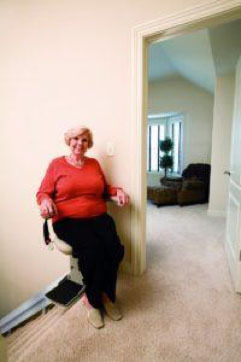 Yes, we offer a stairlift rent and lease program. If the home modification does not increase your property value, you can deduct the whole cost as a medical expense. Internal Revenue Service (IRS): Your stair lift may actually qualify for tax deductions. … The IRS also permits those with disabilities to claim some of these expenses as a tax deduction. Unfortunately, Medicare, which is insurance that provided by the federal government for elder people, does not cover stair chair lifts. 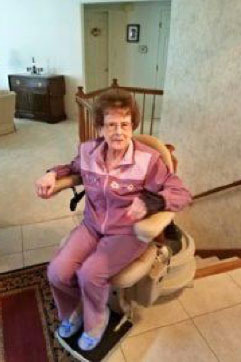 A stair chair lift is classified as a “home modification” by Medicare instead of “durable medical equipment”. A significant proportion of overweight people also suffer with vertigo which puts them at risk on long flights of stairs. But here’s the problem; the largest Stair lifts have a maximum weight limit of 500lbs. Most chairlifts are made up of three main components: a rail, a carriage and a seat. The carriage of the stair lift contains the motor which powers the lift up and down the rail or track. The rail is normally made of Aluminum; this fits directly to the treads of the stairs (not the wall), and the stair lift seat simply sits on top of the carriage and has the controls in the arms to send the stair lift up or down. The Brooks Stair lift also has two remote controls allowing multiple users to direct the lift both up and down the stairs. Yes, because the lifts are all battery operated. The chairlift will be able to provide you with ample trips up/down the stairs after the power goes out. Yes! All stairlift companies should measure your stairs, measure you and take your particular environment into consideration. A full and proper assessment must be done to make sure that your stairlift fits your staircase, meets your needs and is safe for you to use. This assessment is no-obligation and free of charge, and should take no longer than an hour, depending on the staircase. Stairlifts are very economical and environmentally friendly. A stairlift only cost a few dollars a year to run. 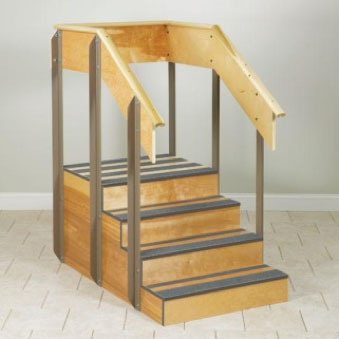 Depending on the stairlift model you choose, delivery times can vary from around next day to two weeks for straight stairlift, and from one to six weeks for curved stairlift as the rail will be manufactured bespoke to your staircase turns and dimensions. Stairlifts are as individual as you are – Each chairlift should be customized to the unique staircase and each individual customer’s requirements. Will the internet or newspaper do a full assessment to make sure the lift is fit for purpose for you and come and fix your stairlift if you have a problem? Unlikely, we’ve had customers who have bought a stairlift and been caught like this and called us in to help them right their mistake. Stairlifts are very technical pieces of machinery and should only be installed by a recognized company and a qualified and experienced stairlift engineer. We have seen stairlifts installed by non-qualified persons that are dangerous and compromise your safety and the safety of other people in your home. Always make sure that you buy a stair lift from a reputable company that has qualified installers. See Stairlift consumer reports and Starlift reviews. Yes, there are access lift stair-lift models that can be built on a straight or curved outdoor staircase. 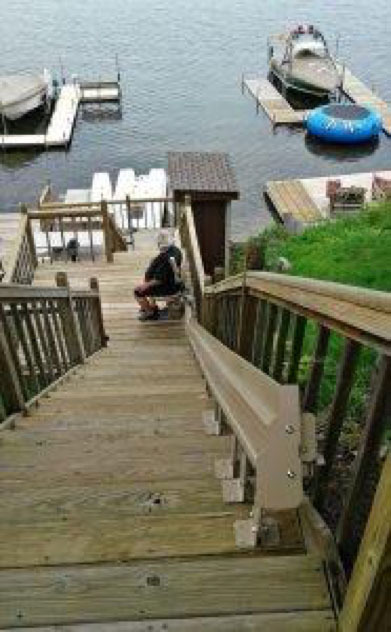 Outdoor stair lift models are just like indoor models. The only difference is that the outdoor models are built to withstand the outdoor elements, even in Minnesota. There is also a cover that comes with the lift to protect it when it is not in use. A common household 120-volt outlet is all that is needed. Battery (DC) powered stair lifts run off around 24 volts powering an electric motor, which makes them quiet and energy efficient in use. The loudest noise you will hear from your stair lift is a beep to let you know that it is about to start its journey up or down your stairs! The rail of a straight stair lift sticks out approximately 16 inches and a curved rail will stick out approximately 20 inches. This is because the track has to go all the way to the floor for a safe and easy exit. If this is an issue for your home, a manual or power folding track can be added. The stairlift includes a transformer that is permanently plugged into a standard 120 volt power-point. The power-point can be either at the top or bottom of the stairs. When the stairlift is parked, the batteries are automatically recharged. Safety certification for these chairlifts is based on single passenger per ride only. Only adults who are familiar with the operation of the chairlifts (having read the user manual or been shown by an experienced user) should use the chairlifts. Under-aged and mentally disadvantaged persons may only use the stairlift under supervision. Never exceed the maximum permissible weight for your specific model. 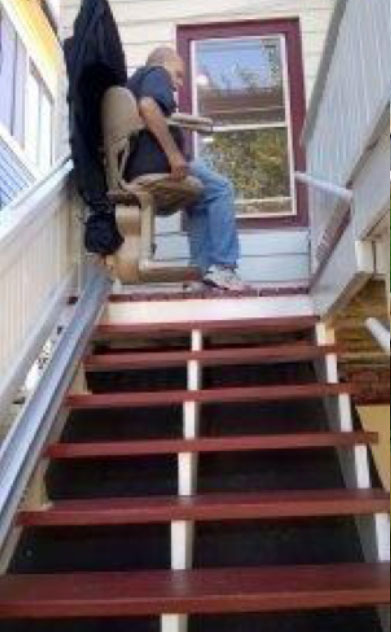 The stairlift is exclusively intended for the transportation of one person per journey. Never use the stairlift for transporting animals or goods. We most commonly call a seat that travels up and down a stairway on a rail a stairlift (or stair lift, with a space). In some countries, they are often called chairlifts (or chair lifts). We’ve even seen them called chair stair lifts! Yes, they are all the same thing. The very same model from a manufacturer is sometimes labelled differently to suit the local usage. Stairlifts are known variously as stair lifts, stair-lifts, chair lifts, stair gliders and by other names. This type of chair lift should not be confused with the chairlift used by Minnesota skiers. The term stair climber can refer either to stair lifts, or more commonly to the exercise equipment by the same name. Hopefully, if you’re reading this question, you’ve searched on one of these common terms and found us. 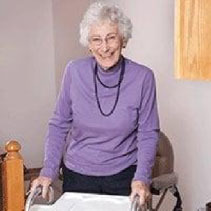 Stair lifts mobility equipment comes in different models to fit many stair formations. Each person must consider his or her own architectural space, lifestyle, and other factors when trying to decide which type of access lift is right for him or her. Straight stair lifts are designed to go up and down straight staircases only. Straight lifts are trimmed to fit the staircase, so they can match the exact length of the stairs where installation is taking place. 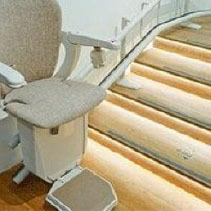 Straight chair stair lifts are not custom made but are instead mass-produced. They’re also easy to ship and install. They cannot, however, accommodate landings, curves or turns—but being modular and easy to put in place makes them the most economical variety of lift chairs. 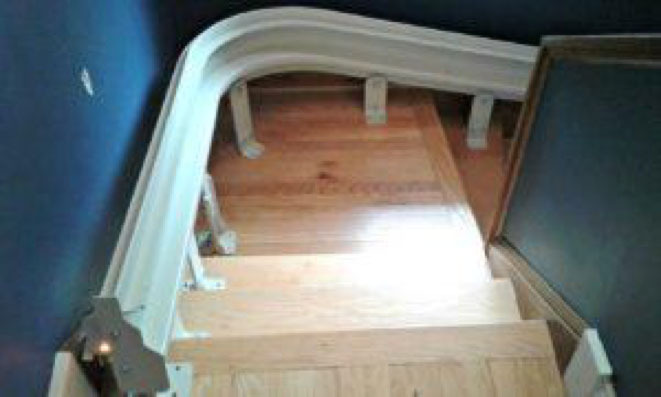 Curved staircases, stairs with landings, and any staircase that turns or varies from straight all require a custom-made unit to fit that particular staircase. 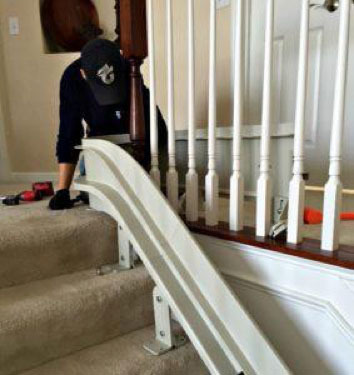 Stairlift companies use a variety of special tools and methods to determine the exact curvature of the stairway, and then install the railing to fit. Each chairlift unit requires a great deal of planning and design to ensure that the home lift will fit the particular staircase where it is being installed. Narrow Stairs: If a set of stairs is especially narrow, it may not be able to accommodate a seated stair lift. In this case, a standing stair lift can usually work provided that there is enough headroom for the user to stand erect on the platform. Health Conditions: Some health conditions make it difficult for people to bend their knees. Standing stair lifts make it possible to go up and down stairs without bending the knees and without sitting down. Conditions: Some people feel more comfortable standing than sitting, and therefore prefer standing stair lifts. Perch lifts function in much the same ways as standard stair lifts, with the same features. Perch lifts have arm rests for balance and comfort, and braking mechanisms that can prevent the access lift from running into someone or something on the stairs. A Stair lift is a moving mobility stair chair or platform lift for stairway access to travel to different levels of a home and is sometimes called an automatic chair, automatic stair lift, stair-lift, chair lift, curved rail stairlift, disabled lift, elderly lift, handicap lift, home stair lift, inclinator, outdoor stairlift lift, perch stairlift, ramp lift, seat lift, stair chair, stair elevator, stair glide, stairlift, stair rider, stair stepper, stair climber, stair elevator, staircase lift, stairway chair lift, stairway lift, stair chair, stair climber, stair elevator, stair glider, stair glide, staircase chair lift, stairlift, stairs chair lift, stairway chair lift, standing lift, straight rail stairlift, super glide and wheelchair lift. Most carriages have a chair seat with folding arms and a folding footrest for space saving purposes; so that others in the household can easily use the stairs as normal. Other than the characteristic interior straight rail stairlift some special stairlift models have a stand-on platform, a multiple use sit or stand stairlift, a ‘stand stairlift’ or a “perching” seat stairlift, also known as a “perch” seat stairlift, outdoor stairlift and curved rail stairlift for curved staircases. A stair lift (sometimes called a seat lift) is a device that a person sits on to be lifted up the stairs. These devices look like seats that have been attached to a staircase. Wheelchair lifts are like miniature elevators, consisting of an enclosed platform that can accommodate one person inside a wheelchair. Yes, in almost all cases the lift will fit. Our certified stairlift experts can help you determine if there is an issue at all with the width of the staircase. Stair lifts are used on a daily basis, and like any expensive piece of machinery, may eventually begin to wear out. Taking care of your assistive technology may therefore involve performing some maintenance. If you’re new to lift chair ownership and are not sure how to take care of your machine, you can find a lot of this information in your owner’s manual. The owner’s manual will tell you how to clean your lift, what tools can be used for cleaning, how to perform small maintenance tasks yourself, and what problems must be addressed by a professional with Stairlift repair services. Here’s a sampling of the types of DIY maintenance you might be in for if you install a stair lift in your home. Stairlift owners should use a dry microfiber cloth to clean the seat and controls. Like any other expensive piece of equipment, stair lifts need regular tune-ups in order to keep functioning properly. Have a stair lift tech come to your home on a regular basis, even if you’re not experiencing problems with the unit. Check your chair periodically for loose screws, nuts and bolts. Make adjustments as necessary, but be careful not to over-tighten. Over tightening can lead to stripped screws. The rails on your stair lift help the chair move up and down, and keep the machine functioning properly. If the rail becomes dirty, cleaning can become difficult. Use the rag to wipe off any dirt from the rail. Push a small corner of the rag into the rail and then run the rag up and down the rail with a screw driver to help. In some cases, your chair’s rail may benefit from a light spray of lubricant. Use only lubricants that are specifically mentioned in your owner’s manual. Failure to follow the advice and suggestions in the manual can cause the warranty to be voided.